The Phoenix area has had a very mild winter this year. No hard freezes, very little rain or storm activity and hardly a day that wasn't cloudless. Although the temperatures have dipped down to the high 30s at times, the days remain pleasant and sunny - the very reason why we get so many snowbirds this time of the year! Our high country has not even seen significant snow fall, which does not bode well for the summer fire season. However, the unseasonably warm weather did make for some pretty incredible birding trips. which have filled three or four days of each week this winter (and hence no blogs!). Even in this mildest of winters, the bare, leafless trees and bleak landscape got a bit dreary as January dragged on and by mid-February I started to yearn for spring and the influx of migrating birds. But just when the trees were budding out and birds were starting to feel frisky, Mother Nature decided to throw some cold temps and wet weather our way. Nothing serious, fortunately, but enough to remind us who is in control. The sudden cold and dampness brought on my annual cold and this time it worked its way into my chest and resulted in a nasty cough that kept me house-bound and miserable. Yesterday, though, the clouds cleared and it was nice enough that I was able to beat down some of those winter blues with a little neighborhood birding. Probably the most exciting find for me was not just one, but two hummingbird nests. I have watched on-line live cams of Bella the Hummingbird at explore.org and have seen nests in the Hummingbird Aviary at the Arizona Sonoran Desert Museum in Tucson, but never have I seen one in the "wild." 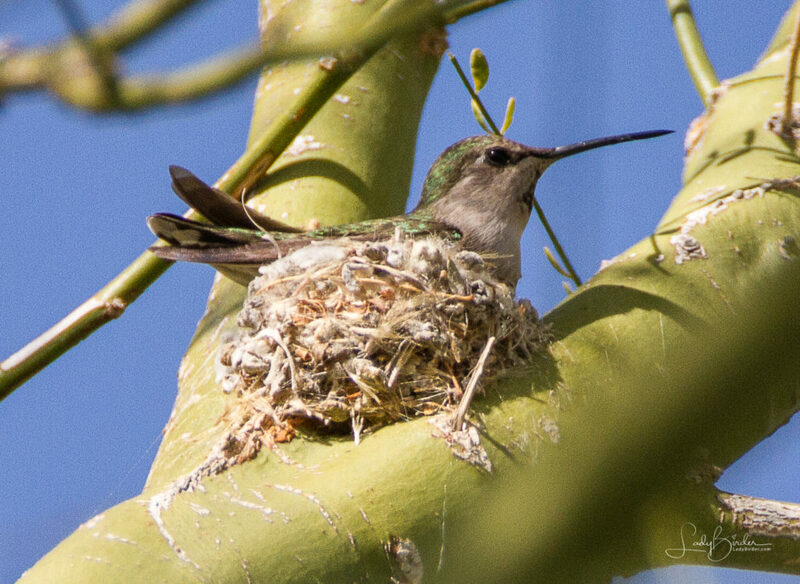 Both of the nests I found were built by Anna's hummingbirds, our area's most common hummingbird. In the live cams, it is difficult to realize just how small these compact, velvety nests are, generally only about 2" in diameter. The female weaves together twigs, plant fibers and bits of leaves to create a spongy floor. She uses spider silk to bind her nest together and anchor it to a branch, creating a perfectly round cup with elastic sides that stretch as the young grow. Hummingbird eggs are about the size of navy beans and most females lay just two, which they incubate for 15 – 18 days. Juvenile hummingbirds fledge (leave the nest) 18 to 28 days after hatching. The advantage of the live cams, of course, is that you can see inside the nests, whereas the two I found are rather high up, barely noticeable with the naked eye. Still, I'm thrilled to be able to keep an eye on these new hummingbird families in real time. Greater Roadrunners tail wagging and flicking. Greater Roadrunner's courtship noise sounded like a puppy whining. 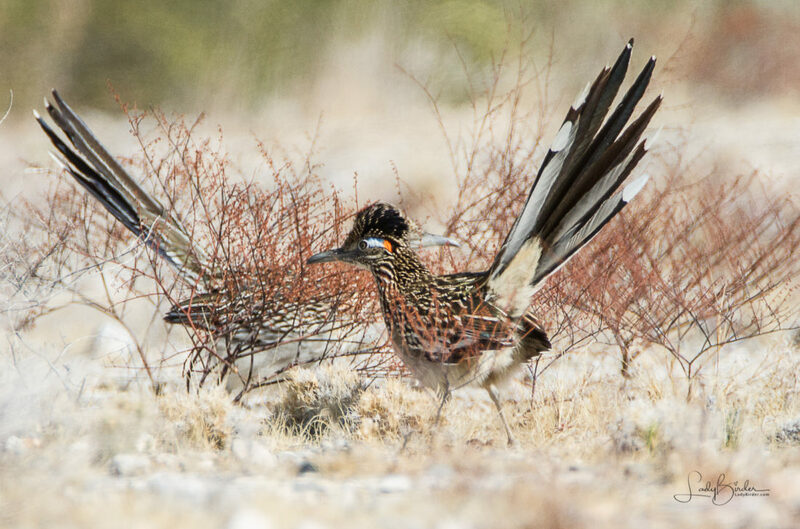 Another interesting thing I found on my first day out in over a week were two Greater Roadrunners dancing the dance of Spring. Roadrunners are fast-running ground cuckoos with long tails and crests, the iconic symbol of the southwestern desert. During courtship, males and females interact and socialize regularly, foraging and roosting together and exchanging vocalizations. Roadrunner pairs form lifelong bonds that they renew each Spring with a series of elaborate courtship steps and calls. They are said to hold a territory all year, so I assume this is the same pair that I saw throughout the summer last year. As I watched today, the couple slowly chased each other around a small bush, first in one direction and then the other, bowing and flicking or wagging their tails in display. Later, I saw them again - one on the grass and one in a nearby tree - and this time was amazed to see the male arch his neck and bow his head nearly to the ground before emitting a whine or "coo" similar to a puppy begging to go outside. The bird in the tree responded with a similar sound, at which point he wagged and flicked his tail as if delighted by her response. Other signs of the coming Spring were all around me as I walked my neighborhood parks and saw a Verdin and a Curved-billed Thrasher gathering nesting materials to build their nests, sparrows chasing each other playfully and a Great Horned Owl perched in a palm tree where a pair had a nest last year. I've read that an owl pair (who also mate for life) may roost together near the future nest site for several months before laying eggs, so I'm keeping my fingers crossed that they will be successful and I'll have fledgings to discover and photograph again this Spring. The weather may be inclement, but birding for just a few hours brought me new delights and lifted my spirits considerably! Thanks, Virginia! I know it has been a while and I’m going to try harder to keep up! 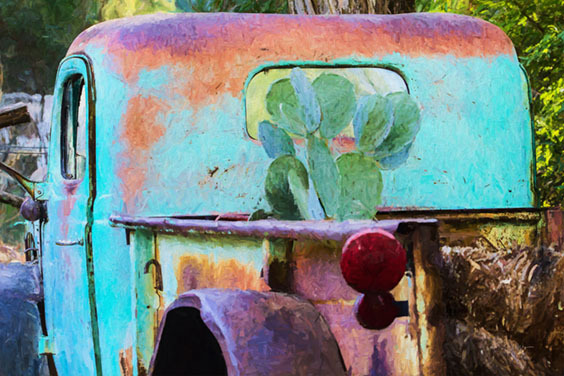 Always a great read and beautiful photos of life around us when we venture out. Thanks, Jerry. We live in such an amazing state with so much to explore! Wonderful! One you learn what to look for in hummingbird nests they start to appear and yes! They are tiny! Amazing things to watch! Glad to see you back! But I know what you’ve been up to so I bet you have a lot more photos to share in the future. Oh, you are so astute! So much more to share. So much more to come. Stay tuned!